Roulette Facts Trivia reports about the oldest casino game with the longest tradition and forever at the top of any players favorite list. Let’s begin with historical facts followed by roulette online. se years has gained quite a reputation based on the unique playing method and history of winning plays. Even though invented by Blaise Pascal, the game of Roulette is considered to be a combination of Roly-Poly, an English wheel game, the Ace of Hearts and biribi, an Italian board game. The roulette wheel had a single zero position prior to being transported to America. American casino owners decided to add a double 00 placement to increase the house edge within the game. Barring an unbalanced wheel, the house is going to collect its percentage---an average of $5.26 for every $100 wagered on a double-zero wheel, unless bettors are not educated enough to make the five-number bet on 0, 00, 1, 2 and 3. On that bet, the house keeps $7.89 per $100 in wagers. Now you know the worst bet in the house! In the end, no strategy is going to guarantee that you will win, as this is a game of chance based on numbers, colors, and a tiny ball spinning around a wheel. 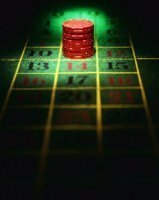 No Roulette system will let you win money constantly, however with small bets, you can be in for the spin and enjoy this casino game online and off. There is a varied selection of Roulette Online versions for passionate players. Roulette Professional, Roulette Royale, Roulette with Neighbors, Double Bonus Spin,Card Roulette and Hot Streak. 3 Wheel Roulette description:The goal in roulette is to anticipate where the ball will land in the wheel and to place bets accordingly. The goal in 3 Wheel Roulette is the same, but with three times the chance to win per spin. Each bet you make on the table bet layout places three chips--one chip for each of the three wheels. Each stack of chips shown on the table bet layout reflects the total stake placed on that bet spot, which is split equally amongst the three wheels. In the movie Casablanca, Humphrey Bogart uses a fixed roulette wheel to assist an impoverished refuge. Diamonds are Forever starring the popular character—James Bond as Agent 007 played the game of roulette. The game of Roulette is known as the Devils Game since the individual numbers 1-36 on the wheel add up to 666. Roulette is referred to as the King of Casino Games due to the association with casinos in Monte Carlo. Blaise Pascal accidentally invented the game in the 17th century. He was originally working on developing a perpetual motion device. His aim was to create a device that produced more energy than the device needs. Francis Blanc, the man credited with adding the single zero to the roulette wheel also established the first casino in Monte Carlo. Over 7 years between 1904 and 1911, William Nelson Darnborough from Bloomington, Illinois challenged the monstrous Monte Carlo casino at roulette winning close to half million dollars--in early 1900s money yet. In 1971, Dr. Richard Jarecki operated on the casinos in Monte Carlo and San Remo to the tune of $1,280,000. Dr. Jarecki was a biased-wheel player who looked for wheels that were off. From 1986 to 1989, Billy Walter’s roulette teams won approximately five million dollars from casinos in Las Vegas and Atlantic City playing biased-wheels. But all the above biased-wheel players owe a debt of gratitude to the granddaddy of biased-wheel play--the man who might have invented it--Joseph Jaggers who won $325,000 in 1873 from Monte Carlo. Charles Wells is another famous winner due to his extraordinary luck at the wheel. He is recognized as the Man that broke the bank at Monte Carlo. Unfortunately, Mr. Wells continued to play until he lost all of his winnings. Roulette facts trivia reports about one of the most extreme Roulette bets placed by Ashley Revell in 2004. Ashley sold all his possessions for a total $135,300. He bet all the money on Red at the roulette table. Luckily, the ball fell on the Red and Ashely won $270,600. He exited leaving the dealer a $600. tip and later started his poker company online--Poker UTD. At Caesars Palace on July 14, 2000, at 1:35 p.m., the number 7 came up six times in a row at Roulette Wheel #211. The odds are over three billion to one for this unique event. While players, pit bosses and dealers were aghast about this amazing repeating 7, the casino lost only a paltry $300. You may have thought millions were lost, but then again, how many players are going to bet the same number 6 times? The number 10 appeared six times in a row on July 9, 1959, at El San Juan Hotel in Puerto Rico. July seems to be the weird and wild month for the casino game of Roulette. Edward O. Thorp published a book titled Beat the Dealer resulting in his nickname as the Father of Card Counting.